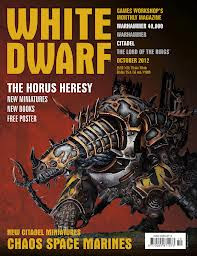 Hey all, just a quick note to say that, if you haven't already got your copy via subscription, make sure you pick up a copy of the new look White Dwarf (Oct 2012 edition). Quite simply, I think the overhauled format is fantastic! The first major thing you'll notice is that the logo has been updated with a slightly retro feel. Once you get the mag out of the cellowrap, you'll also see that the chaos figure on the front has been finished in a nice glossy effect too... Lovely! The layouts and colour pallettes throughout the magazine have all been revised and the approach to photography and other imaging has been updated inline with the new style guide too. My initial thought was that it now represents the high-end video game mags like Edge and I believe the whole publication is a little thicker too. All in all, a great new take on the magazine. I'd be interested to see what the revised subs price will be, but for the moment, £9.00 a quarter is a right bargain, given the also-updated cover price of £5.50!! Anyways, make sure you check it out, it's a cracking edition.